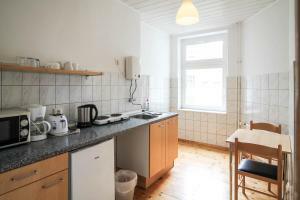 Featuring a bright courtyard with dining tables, Kolo 77 offers spacious rooms in Berlin's quiet Gesundbrunnen district, just north of the city centre. Wollankstraße S-Bahn Station is just a 10-minute walk away. 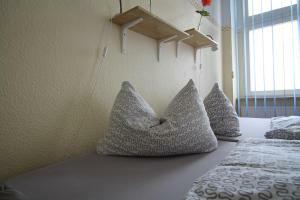 The bright rooms at Kolo 77 come with satellite TV and a refrigerator, as well as en suite bathroom facilities. 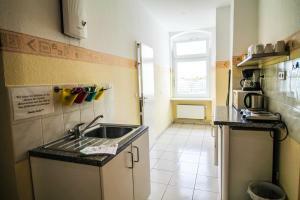 The apartments also offer a microwave. A breakfast buffet is served each morning in Kolo’s bistro, and during the summer months guests can enjoy their meal in the courtyard. The deck chairs in Kolo 77’s beach area provide the perfect opportunity for relaxing. 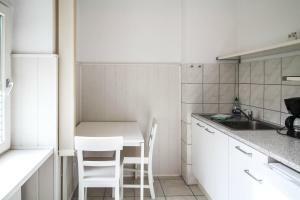 Kolo 77 is just a 5-minute walk from the bus and tram stops, and Osloer Straße Underground Station is a 15-minute walk away. 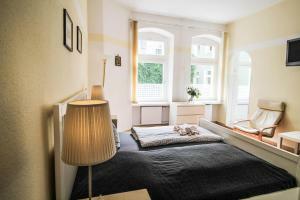 Within a 15-minute journey, guests can reach the main tourist attractions in central Berlin, or nightlife areas in the popular Prenzlauer Berg district. The hotel is accessible by car via the A100 motorway ring road. Free parking spaces are available nearby. Please contact the hotel in advance if you wish to check in after 21:00. Please inform Kolo 77 in advance of your expected arrival time. You can use the Special Requests box when booking, or contact the property directly with the contact details provided in your confirmation. Modern room with satellite TV, kitchen area and a bathroom with a hairdryer. Modern apartment with satellite TV, kitchen area and a bathroom with a hairdryer. Modern room with satellite TV and a bathroom with a hairdryer. 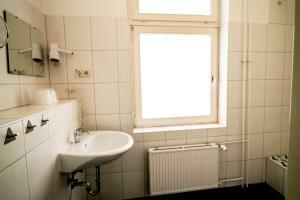 Rooms are 40 square metres and have access to a private bathroom in the hallway.